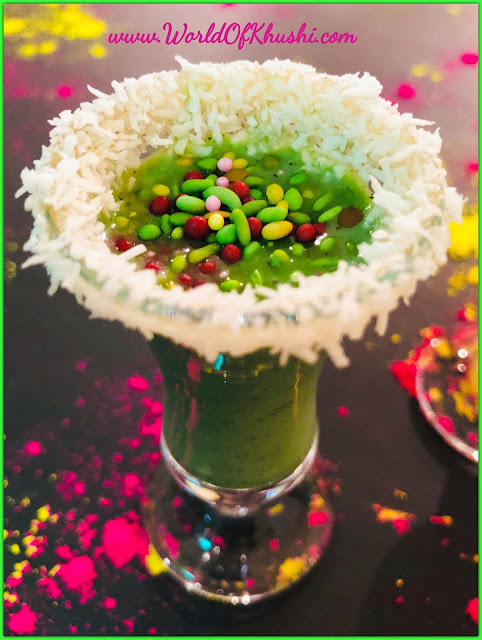 Holi is all about Colors, Fun and lots of Delicious Recipes. But we really don't want to spend all the time in Kitchen that is the reason people start making Holi Recipes a week before. But if in case you are very busy, you don't have any time or you want something which is too easy then I have to share something. The recipe which I am going to share is my secret recipe which I used to make when I was in middle school and not allowed to cook much. This recipe only take 4 ingredients, doesn't involve any cooking and all you need is only 5 minutes to make. For making the recipe more festive for the HOLI, I am adding some food colors. We are making Colorful Coconut Ladoos!! Easy, less time consuming, tasty and eye-catching! let's see how to make it!! Step 1. In a bowl; mix Coconut Powder, Condensed Milk, Cardamom Powder. Step 2. Mix it very well. Step 3. Take 3 different bowls. Step 4. Separate the mixture in 3 different parts and put them in 3 different bowls. Step 5. In first part add 2 drops of Red Food Color. Mix it well. Step 6. In second part add 2 drops of Yellow Food Color. Mix it well. Step 7. In the third part add 2 drops of Green Food Color. Mix it well. Step 8. Start making small balls from all the Mixtures (Red, Yellow and Green). Step 9. Once all the Ladoos are ready (Red, Yellow and Green), dust some Dry Coconut Powder on top of it. Your tasty 5 Minutes No Cooked Colorful Coconut Ladoos are ready. This recipe is very special for me and hope that your Guest and Family will totally love this Ladoos. If you make them then please share your feedback and recreations pictures with me. For more such tasty Recipes stay tuned with Khushi's World. Please show your support by liking and sharing the post. You can also follow us on Khushi's World Facebook Page, Instagram, and Pinterest. I will see you in the next Post till then take care.